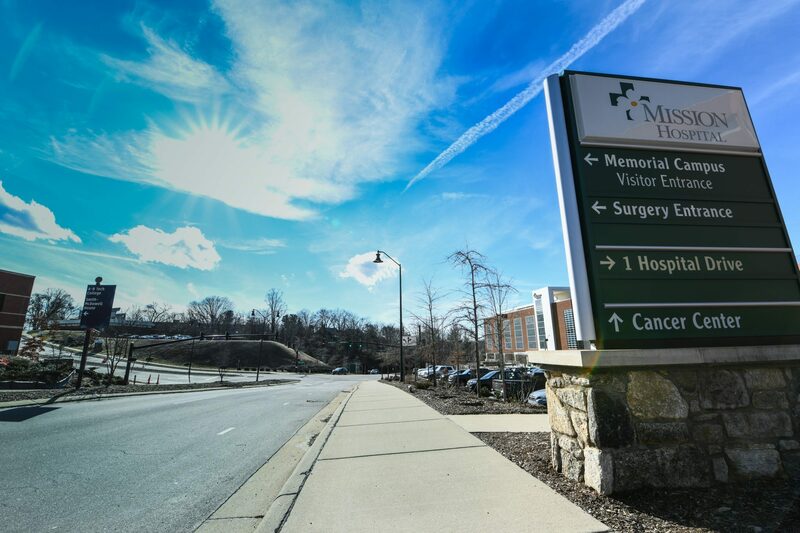 McGill assisted Mission Health with improvements to the road network adjacent to Memorial Mission and St. Joseph’s campuses in Asheville, designed to improve traffic flow and accommodate future development. There was a need to add connectivity between Biltmore Avenue and McDowell Street. All improvements had to be constructed while maintaining traffic access and utilities to two hospitals, Asheville High School, Asheville-Buncombe Technical Community College (A-B Tech), and adjacent medical offices and businesses. Due to the significant grade differences between Biltmore Avenue and McDowell Street, approximately 30-35 feet of cut was required at the deepest point in both Hospital Drive and Victoria Road. The new alignment and grade changes necessitated the complete replacement of all utilities within the project limits. Temporary pavement was installed to allow Victoria Road traffic to continue using parts of the old Victoria Road and Hamilton Street alignments, while the southeastern portion of the new roads were constructed. Traffic was shifted to the newly constructed roads, to allow the remaining hill to be excavated and the new roads to be constructed on the northwest portion of the project. The final phase included a surface layer of pavement on the entire project area and completing the project’s landscaping; this provided a clean asphalt surface without remnants of traffic control striping remaining from previous phases. The new road, named Hospital Drive, included a new four-way intersection with Victoria Road to the south and Hamilton Street to the north. The new alignment and grade changes necessitated the complete replacement of all utilities within the project limits, including a 12-inch water line, sanitary sewers, storm drainage, power lines, telephone, cable television, fiber optic communications, and gas mains. The three major roads in the project are four-or five-lane sections with a center landscaped median, as well as landscaping along the sidewalks that complies with City of Asheville’s requirements. The landscape plans were designed to be drought-tolerant and enhance the appearance of the road corridor. The completed project includes new pedestrian facilities, a bus shelter, and bicycle lanes in keeping with the master planning efforts of the City of Asheville. The right-of-way and adjacent Mission property was landscaped to not only meet City ordinances, but also to enhance the appearance of the road corridor. Mission Hospital is the busiest surgical hospital west of Raleigh, North Carolina, and the second busiest in the state. Traffic improvements in an ever-growing city, like Asheville, are necessary for the community.